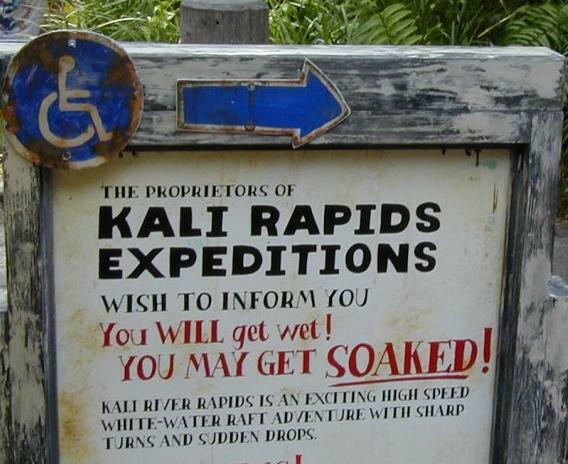 Description: This water ride will put you in a 12 person raft for a white water adventure. 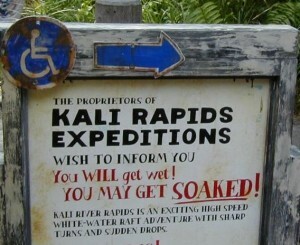 On this ride you will get wet, it is just a matter of how soaked you will become. There is a water protected area in the middle of the raft for you to put your belongings, but it is not 100 percent safe! Things still may become damp. The ride take you through the rain forest and stresses the park theme of conservation. You will see how the logging industry is negatively effecting the ecology of the area. This is a great ride to do on a hot day, but it is also a very fun ride on a cooler day for those who don’t care about a slight chill and will enjoy a ride on a main attraction with little to no wait! Fastpass: Yes. If you arrive early in the day you should be easily be able to board this without Fastpass. As the day progresses getting a fastpass is advisable. 1. Take some time exploring the queue area. The attention to detail is astounding. If it is early in the morning you can walk at a leisurely pace through the line as you allow other guests to pass. 3. This ride is short and sweet lasting about 4 and a half minutes. It is also not very scary so it is good for most members of the family. 4. A good plan for touring Asia is to get a fastpass to Expedition Everest and then ride Kali River standby first thing in the morning. If you arrive at Rope Drop you can even ride both attractions twice with little wait! This entry was posted in Animal Kingdom, Asia, Attraction Spotlight and tagged Animal Kingdom, Asia, expedition everest, Kali River Rapids, Water Ride. Bookmark the permalink. ← Take a Day Off…Boating at Disney!